If you have been dreaming about a second home on a lake for you and your family, this Residence destination trailer is the perfect choice! This model offers everything you will need in a getaway oasis, like the king-size bed in the private bedroom that has its own exterior entrance door so that you can slip in and out without waking other campers. The kids will certainly love spending their nights sleeping in the loft, and your guests will sleep comfortably on the sofa sleeper in the front living area. You will find the 60" dual pane sliding glass doors provide additional natural light and a beautiful view of outside. 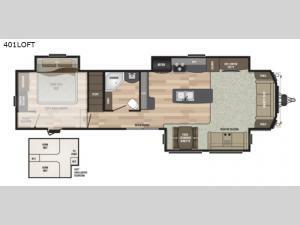 With any Residence destination trailer by Keystone RV, you will appreciate the larger living areas, family-size bathrooms, and abundant residential features. The full kitchen will remain an exceptional centerpiece for each Residence trailer with its 18 cubic foot residential refrigerator, stainless steel undermount sink, raised panel upper cabinets, and extra large picture window at the dinette. You will also appreciate how easy it will be to grab a cool drink of water to quench your thirst after a long and exhausting day in the woods because of the water purification system that has been installed in every Residence.